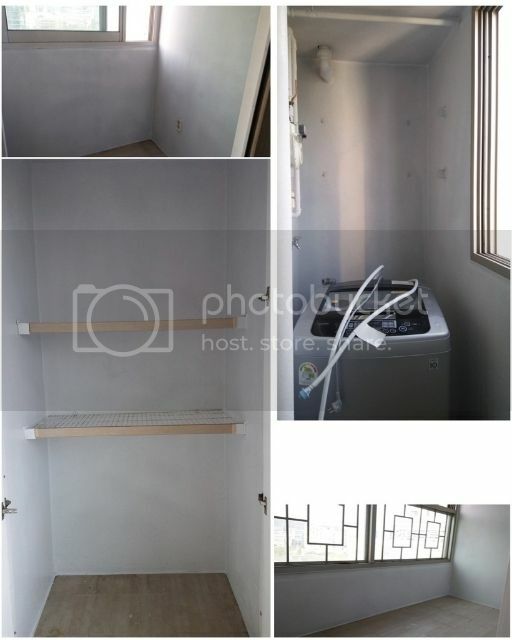 Post winter molds are common problems in Korean apartments. And ours wasn’t exempted. It isn’t a pretty sight. It isn’t a pretty feeling either when you inhale the air around these grossness. Unfortunately, this problem is common here in Korea. These molds creepily appear during and after winter. When the temperature goes really down, especially beyond zero, moist forms in our walls. This usually happens at the veranda, laundry area and some storage spaces that aren’t reached by the heater.My laundry area was the hardest hit followed by the storage area in one of the rooms. This is the room least used so I found no need to turn on the heater here. The storage area in the veranda also showed those ugly black molds. I had to tell my husband the urgency to have the walls treated. I know, how the walls look doesn’t show my urgency. They have become really bad because I waited after winter. I thought nothing much can be done while the temperature was at its lowest. And I was super busy during the early weeks of Spring. Finally, through the staff from my husband’s office the broker and I agreed to a date to have the walls repaired and treated. Today, the repairman came and invaded my living room. I was dumbfounded when I saw this machine! 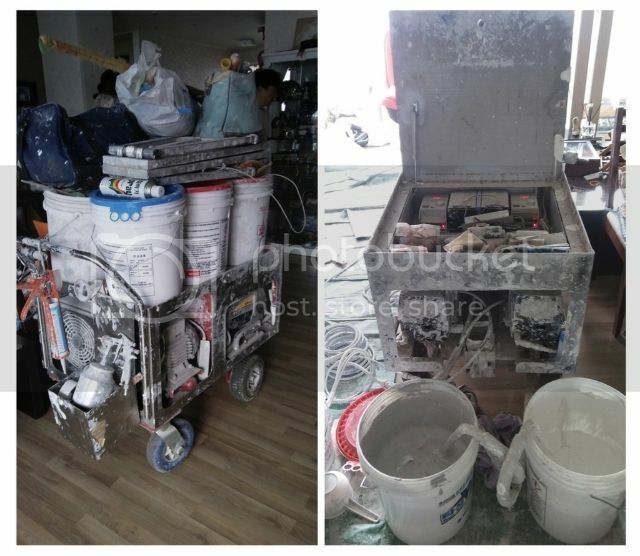 I must say, it’s an efficient cart.The left photo shows the machine with pails of paints on top followed by a foldable bench. Those plastics contain floor covers and transparent wraps. The repairman and I managed to understand each other. He said repair work will take 4 hours! He moved aside all furnitures and his machine dominated my house the entire time. The man was very respectful and kind and went about his work efficiently. And he did finish the work a little past 4, as scheduled. He covered the floors in the living room, kitchen, the room affected, and the veranda. He wrapped the refrigerator, tables, chairs – so no matter how dusty the house was, I can’t complain. Again, I must say he went about his work systematically and efficiently. I was just caught by surprise as I didn’t expect my house overhauled like that. The affected areas are now cleared of those nasty molds. Hopefully never to come back. My house will not be back to normal until after 3 days. I can’t put back stuff at the affected areas until they are completely dry. And that means, I can’t use the washing machine for 3 days. But that’s a little sacrifice. I can’t bear another day thinking my family is going to get sick from all those creepy black molds. If you find black molds in your apartment, don’t follow my example. I waited too long to ask for repair and treatment. Ask the owner to have it immediately treated. Or if you are the owner, have it treated the soonest possible time. Health is wealth! When it comes to efficiency East Asian countries take the cake, I always found people there to be extremely hard working, fast, efficient and yes respectful, that is a typical eastern trait. The lesson that you want to put across and we all must learn is to deal with the problem while it is at its infancy otherwise be prepared to shell out top dollar and discomfort for some time, while repairs are taking place. That machine looks a lot more promising than the stories of workers just putting a new layer of wallpaper on top and calling it a day. 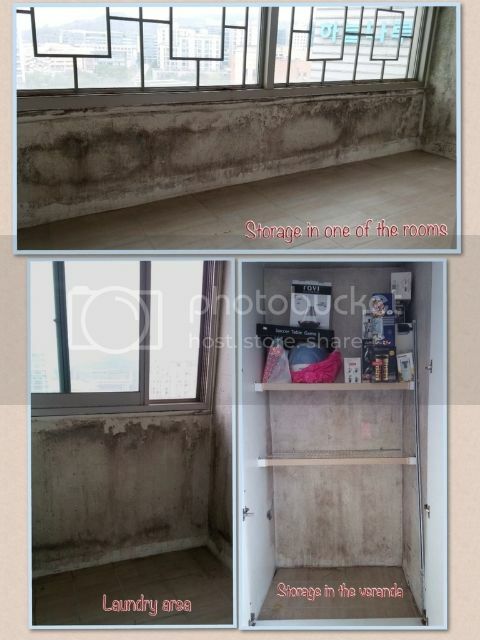 Mold is one of those annoying issues that most of us Korean expats experience. It happens in new or old apartments and it seems like no one is safe from it. I hope your repairmen did a fine job! OMG! I have the same problem in my bathroom floors. I have to clean it twice or thrice a week. I’m glad you found a good repairman. Karla recently posted..How to get a SIM Card in Korea? Yuck! The constant mold problems in Seoul are really the worst thing ever. We’re constantly battling it in our apartment because we live on the top floor and the rain coming down hits us directly. Doesn’t help that the construction and insulation in Korean apartments are not the best sometimes either. Grr… anyway, glad you got it dealt with. I hate thinking about our little one breathing it in!